Housing Development Corporation welcomed the Vice President of World Bank for the South Asia Region Mr. Hartwig Schafer to Hulhumalé, this afternoon. Mr. Schafer was welcomed by Managing Director Mr Suhail Ahmed and management team of HDC consisting of Director of Planning and Development Mr Ismail Shan Rasheed and Director of Projects Nawaz Shaugee. He was accompanied by Nena Stoiljkovic, the International Finance Corporation Vice President for Asia and the Pacific, and officials of World Bank and Ministry of Finance of Maldives. 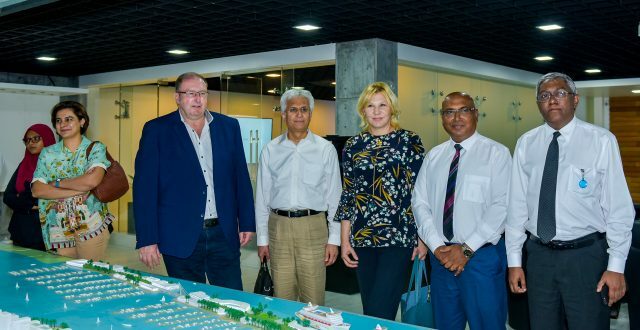 During his visit, the Vice President was presented about Hulhumalé and its developments including the rapid changes in the city in terms of population, infrastructure, economy, green initiatives, supplementary projects needed to support the population. The recently completed Aspire project is the first World Bank supported project in Hulhumalé, under which solar panels were installed on 34 flats in the city. Currently HDC, along with the government of Maldives, is in the process of planning further World Bank supported projects for Hulhumalé.